Being a student comes with plenty of perks, and that includes discounts to a variety of services and places. Here is a round-up of on- and off-campus freebies to help you save money this semester. The cashier’s office, located on the first floor of Brotman Hall, offers the U-Pass TAP sticker. When attached to your Long Beach State student ID card, the pass grants you free rides on any Long Beach Transit bus. The University Library also offers access to several streaming services, including Kanopy, a website similar to Netflix where you can watch documentaries, classic films and more. 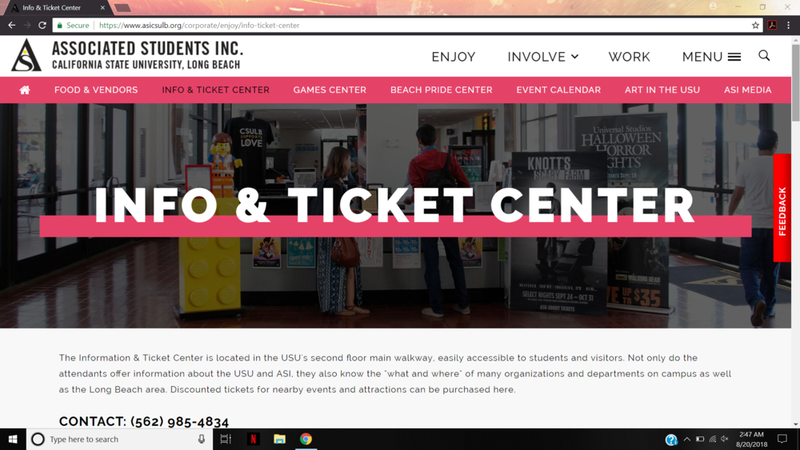 If you’re looking to have fun off campus, the information and ticket center on the second floor of the USU offers lower-priced tickets to several different movie theaters, as well as amusement parks. As far as academic materials go, Long Beach State’s University Library is a great tool. Offering everything from books to articles and movies, the University Library is a source for free research and entertainment. The lower level of the library houses maps, newspapers, magazines, audiobooks, two Blu-ray disc players and two DVD/VHS players. Associated Students Inc. offers a non-perishable food program called Beach Pantry, and it operates as the official pantry for students. Students are encouraged to drop by University Student Union, Room 302, up to three times a week, and they can receive five free food items per visit. A student ID card or ID number is required for access to the pantry. Students can sign-up for a free six-month trial of Amazon Student. The subscription comes with free two-day shipping, access to prime instant video, unlimited storage with Prime Photos and more. Anyone with an active student “.edu” email is eligible for the offer. Students with a valid student email address can get access to Office 365, which includes Word, PowerPoint, Excel and OneNote. With your student email, the music streaming service offers you a discounted rate of only $4.99 per month. Spotify, much like Apple Music, offers students a discounted rate of $4.99 per month, as well; what’s more, their new partnership with Hulu means you get access to Spotify Premium and Hulu limited commercials for $12.99 a month. Current Spotify Premium users will have the opportunity to try the bundled subscription for only 99 cents for the first three months. The Washington Post is the only newspaper that offers an entirely free subscription to students and is accessible with a valid “.edu” email address. Amtrak offers discounts to help you bring down travel costs. Students ages 13 to 25 can save 15 percent on each Amtrak trip with a valid student ID. This application promotes a distraction-free learning environment by letting you earn points for not using your phone during classes. Points can then be redeemed for free food at participating restaurants, including Papa John’s, Chick-Fil-A and Cold Stone Creamery. This online grocery store offers free student memberships for a year through their Thrive Gives program. Thrive is committed to selling healthy snacks and ingredients for a variety of diets, including paleo, vegan, and gluten-free. Order $49 worth of groceries, and your order will ship for free.